Google's crowded "search options" sidebar has a new feature: restricting the results to sites related to nearby businesses. Google already determines your location and it shows results appropriated for your location, but now you can see only local search results. There are 3 filters that help you restrict the results to a city, a region or a state. If Google can't find your location or you want to find results for a different location, click on "custom location" and enter a city. Google Blog says that this feature is useful because the search engine no longer has to match your keywords to find a location. 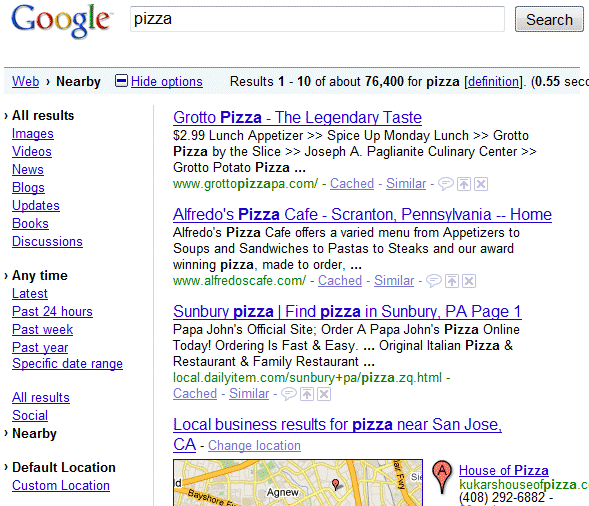 Location has become an important part of the way we search. If you're a foodie looking for restaurant details, food blogs or the closest farmer's market, location can be vital to helping you find the right information. Starting today, we've added the ability to refine your searches with the "Nearby" tool in the Search Options panel. One of the really helpful things about this tool is that it works geographically — not just with keywords — so you don't have to worry about adding "Minneapolis" to your query and missing webpages that only say "St. Paul" or "Twin Cities." 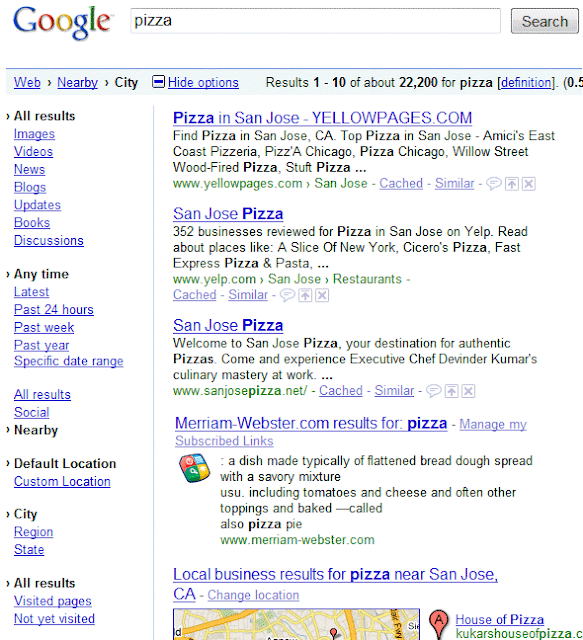 The local search filter for web pages is not new: it used to available in Google Maps and as a Google Search experiment. Could be very useful for competitor analysis. But I think this only works if the companies around the neighborhood all have entries in Google Maps. I love Google,but I think Google Map API should be more easy to use anyway.:)Oops! It would be great of Google to combine this package with Google Analytics. And they are leaders in the field of SMO.